In this article, we look at five simple examples which support the Theory of Evolution. 1. The universal genetic code. All cells on Earth, from our white blood cells, to simple bacteria, to cells in the leaves of trees, are capable of reading any piece of DNA from any life form on Earth. This is very strong evidence for a common ancestor from which all life descended. 2. The fossil record. The fossil record shows that the simplest fossils will be found in the oldest rocks, and it can also show a smooth and gradual transition from one form of life to another. Please watch this video for an excellent demonstration of fossils transitioning from simple life to complex vertebrates. 3. Genetic commonalities. Human beings have approximately 96% of genes in common with chimpanzees, about 90% of genes in common with cats (source), 80% with cows (source), 75% with mice (source), and so on. This does not prove that we evolved from chimpanzees or cats, though, only that we shared a common ancestor in the past. And the amount of difference between our genomes corresponds to how long ago our genetic lines diverged. 4. Common traits in embryos. Humans, dogs, snakes, fish, monkeys, eels (and many more life forms) are all considered "chordates" because we belong to the phylum Chordata. One of the features of this phylum is that, as embryos, all these life forms have gill slits, tails, and specific anatomical structures involving the spine. For humans (and other non-fish) the gill slits reform into the bones of the ear and jaw at a later stage in development. But, initially, all chordate embryos strongly resemble each other. In fact, pig embryos are often dissected in biology classes because of how similar they look to human embryos. These common characteristics could only be possible if all members of the phylum Chordatadescended from a common ancestor. 5. Bacterial resistance to antibiotics. Bacteria colonies can only build up a resistance to antibiotics through evolution. It is important to note that in every colony of bacteria, there are a tiny few individuals which are naturally resistant to certain antibiotics. This is because of the random nature of mutations. When an antibiotic is applied, the initial innoculation will kill most bacteria, leaving behind only those few cells which happen to have the mutations necessary to resist the antibiotics. In subsequent generations, the resistant bacteria reproduce, forming a new colony where every member is resistant to the antibiotic. This is natural selection in action. The antibiotic is "selecting" for organisms which are resistant, and killing any that are not. Start by watching this video (http://tinyurl.com/mvqltlp) while answering questions 1-4. You might have to stop and rewind the video in order to answer all the questions. What are some things that can be fossilized? How can fossils provide information about the evolution of a species? Why can’t fossils provide a complete history of life on Earth? Then fill out the table while watching this video (http://tinyurl.com/od5gseo) and answer question 5. 5. Basilosaurus is a “whale” that was first discovered in the United States. Basilosaurus has small hind limbs, way too small for walking. Nostrils are midway up the head, in-between modern whales and where the nostrils are on land mammals. They probably had a small tail fluke but scientists are unsure. Based on the information in your table above, approximately when did Basilosaurus live? Start by watching this video (http://tinyurl.com/l34a3nf) while answering questions 1-4. You might have to stop and rewind the video in order to answer all the questions. What role does DNA play in an organism’s development? Why do the traits of a species often change over time? What determines whether a mutation is passed on to later generations? The more time that has passed since two species split from one another, the more different their DNA will be. Why? 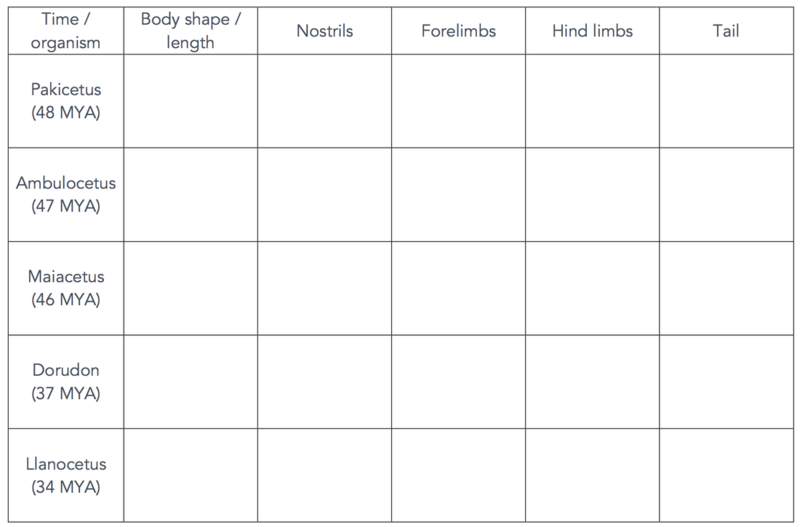 Fill in the phylogenetic tree below with the samples to show the relatedness of the DNA. (USE THE SUPPLIED TREE). Then add to the tree when the different mutations arose. Start by watching this video (http://tinyurl.com/mj3j8x8) while answering questions 1-6. You might have to stop and rewind the video in order to answer all the questions. How does life inhabit newly formed islands? Why do places that are far apart sometimes have similar species? Why was the movement of organisms easier several hundred million years ago? What do you think are some ways that organisms shape their environment? What do you think are some ways that the environment shapes organisms? How can phylogenetic trees provide information on the movement of organisms over time? 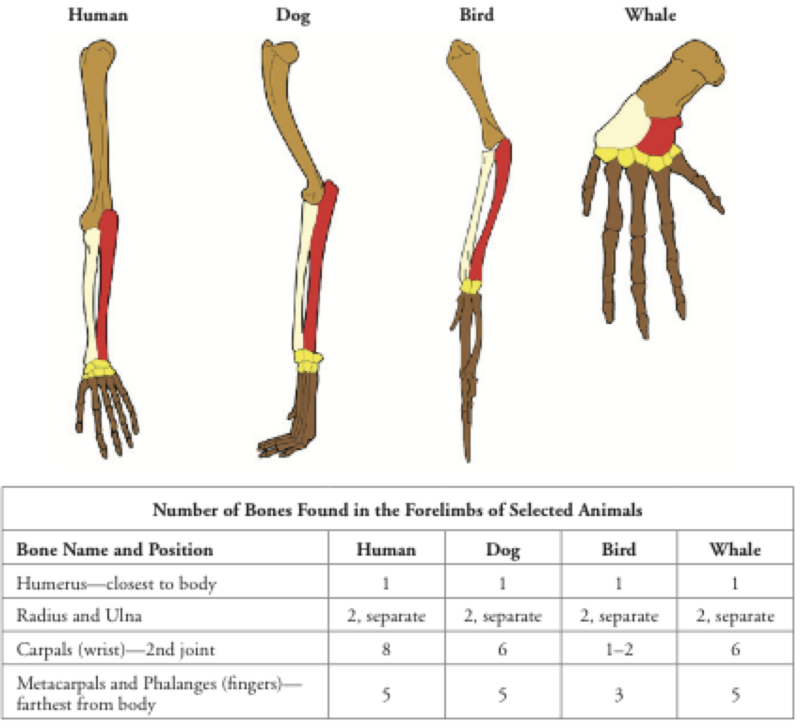 The diagram shows the bones in the forelimb of a human, dog, bird, and while. These are all organisms with a backbone. The human, dog, and whale are all mammals. Read more about homologous traits here: https://tinyurl.com/ybve26fk. Click through the screens until you have read through to the end. In your notebook, answer the following questions. 1. The diagram above shows several homologous structures. These are limbs or body parts that are similar in structure due to shared ancestry, but that may be or may not be similar in function. a. List two or more similarities in the bone structure of the four animals shown. b. List three or more differences in the bone structure of the four animals shown. 2. What do the similarities among the forelimb bone arrangement of these diverse animals tell use about their ancestors? How are these organisms related to each other? 3. 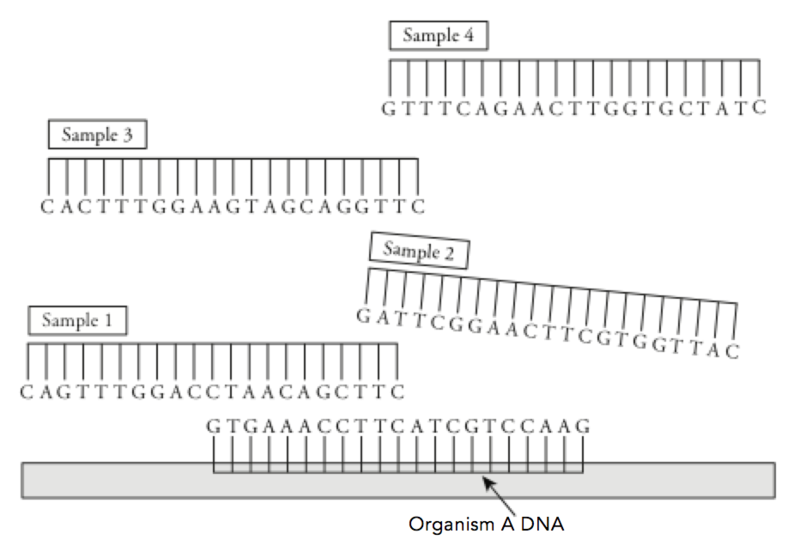 Which two animals in the diagram would you predict have the most DNA sequences in common? Explain.